Following on from Toys R Us this week, we received an email from the guys at Forbidden Planet (every grown up’s favourite shop) to say that they too have Transformers toys from Transformers Revenge of the Fallen on sale today. You can see them on their website too, but personally I’d head down to the store to see for myself, you never know what else you’ll pick up. The UK seems to be having it good right now. 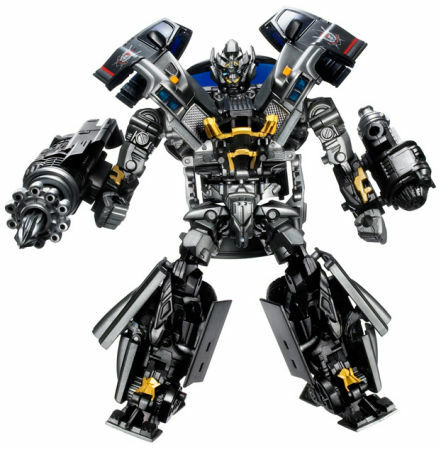 The Transformers Revenge of the Fallen release date has been brought forward to 19th June, and now we have lots of ROTF toys as well. Forum member NeoPrimus has spotted Legends Optimus Prime, Jetfire, Springer and Bumblebee, Scout Dead End and Knock Out and Deluxe Breakaway, Rampage, Sideswipe and Sideways. All were found at his local Argos. Get hunting UK fans, you’re local store may have jumped the official release date (30th May) and released the figures early. Fast food chain Burger King has signed a 3 picture deal to offer promotional toys for the movies: Star Trek, G.I. Joe and Transformers Revenge of the Fallen. Transform Your Way(TM): Starting June 22, fans can look forward to the Transformers: Revenge of the Fallen promotion, which will give guests the chance to take home a range of prizes, from $1 million cash to a 2010 Chevrolet Camaro to movie passes and instant-win food items like the CROISSAN’WICH(R) and WHOPPER(R) sandwich. As part of the Transform Your Way(TM) scratch-and-win game, game pieces will be available on specially marked menu items. BURGER KING(R) will also give guests a second chance to win at bktransformers.com, where consumers can navigate interactive online applications to enter daily for a chance to win $10,000. New BK BBQ DOUBLE STACKTICON(TM) sandwich: The BURGER KING(R) menu will undergo a transformation with this new sandwich. Available for a limited time only for a suggested retail price starting at $2.79 the Transformers-inspired burger allows guests to stack multiple burger patties, bacon, sauce and cheese similar in theme to the “combining” of Transformers characters in the upcoming film. Advertising by film director Michael Bay: Blockbuster director, Michael Bay, directed the national kid’s television advertising spots that will turn the BURGER KING(R) dining experience on its head. 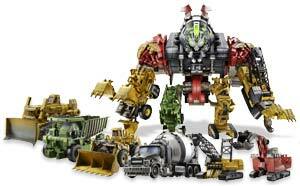 In addition, each BK(R) Kids Meal will come with one of eight Transformers toys that bring the beloved characters and vehicles from the movie to life. Burger King has been an excellent partner for us because of the volume of customer traffic. Burger King and Paramount have enjoyed partnerships before, on the 2007 movie Transformers and 2008’s Iron Man. The best news yet for Transformers fans is that Transformers 2 director Michael Bay is set to direct a special Burger King advert for Transformers. This ensures that the TV spot for BK has the same style as the much anticipated movie, Transformers Revenge of the Fallen. The-Arker.com have provided images of an unknown Audi R8, that will be a Decepticon in Transformers: Revenge of the Fallen. The-Arker has lots of pictures of the vehicle mode and the robot mode, but nothing that gives away what the characters name will be. The bi-annual event of the new Argos catalogue occured yesterday and its now time to analyse the 1802 pages to see what Transformers offerings are inside. Animated Bumper Battlers are shown twice, and Animated Deluxes seem to have a price increase, but Leader Megatron has £10 off. Ironically, on page 1674, it mentions that 2009 is the 25th Anniversary of Transformers. This makes no sense as Hasbro UK (wrongly) said that 2005 was the UK’s 20th Anniversary! 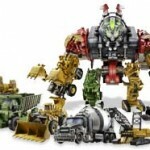 HK-TF.com have posted 7 photos of what is believed to be part of Devastator, who will be appearing in Transformers: Revenge of the Fallen. The figure has no name, and the robot mode isn’t show, but he does transform into an RH400, with a Decepticon logo on the side. The last 2 photos show the figure with what could possibly be his mode for merging into Devastator. Some new pictures of the custom TFC-004 Gear of War set are now up on HK-TF.com. The pictures show close up details of Inferno and his accessories as well as the Soundwave cassette drone.